A batch of these freshly baked homemade vegan brownies will satisfy your inner chocoholic! They’re just like the brownies you remember from childhood – but veganized! 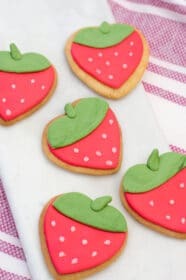 Plus they’re simple to make in just 30 minutes. Is that what you’re asking yourself right now? A really good brownie is dense, fudgy and soft, just like the ones our grandmothers baked for us while growing up. 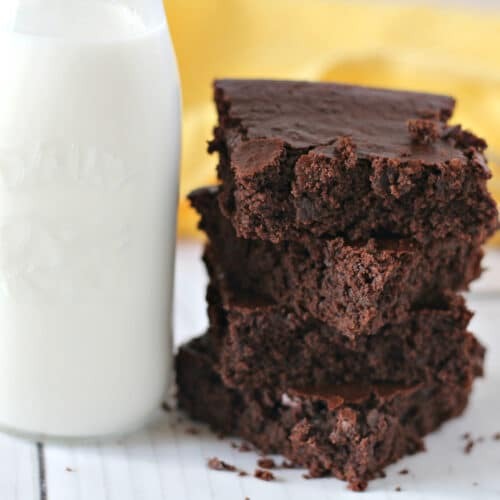 But, traditional brownie recipes are laden with eggs and butter which are needed to emulsify and bind, and give brownies their dense texture. The challenge with vegan brownies is getting that same dense, fudgy texture and rich chocolate flavor without the eggs and dairy products. 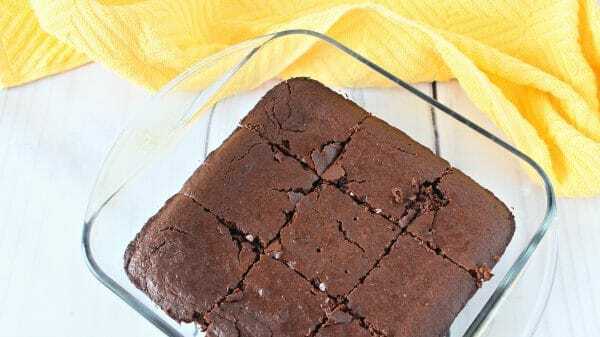 So with a bit of brownie science, and a twist on a few simple ingredients, I’ve figured out this dairy-free vegan brownie that you can binge on – without the guilt! Rich, chocolatey, and totally delicious. In a mixing bowl, cream together your sugar, oil, and water. Next, add in your dry ingredients – flour, salt, applesauce, vanilla, cocoa, and baking soda. Mix very well to combine. 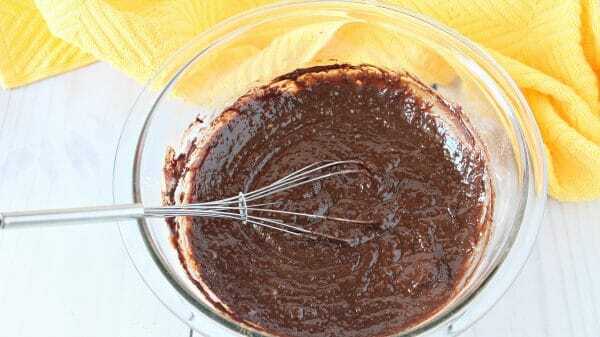 Pour the brownie batter into a greased 8×8 baking dish. Bake at 350 degrees for 20 to 30 minutes, or until baked through. Allow to cool on a wire rack before cutting into 9 squares. And dig in. How easy is that? 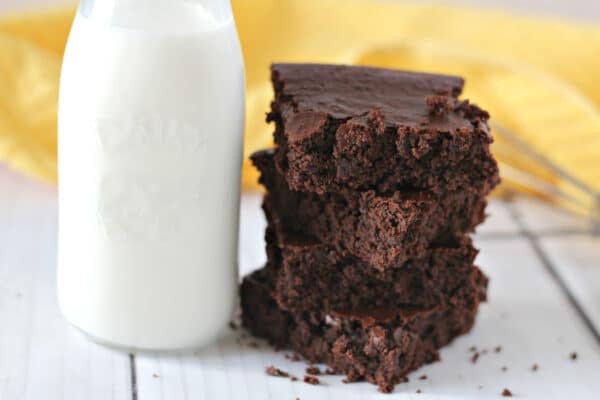 I hope these chewy, chocolaty vegan brownies take you back to your childhood! Yes! I make vegan brownies without eggs by swapping in applesauce for a moist (and slightly sweet) binder. It replaces all the eggs and butter, which also helps cut down on calories and fat. 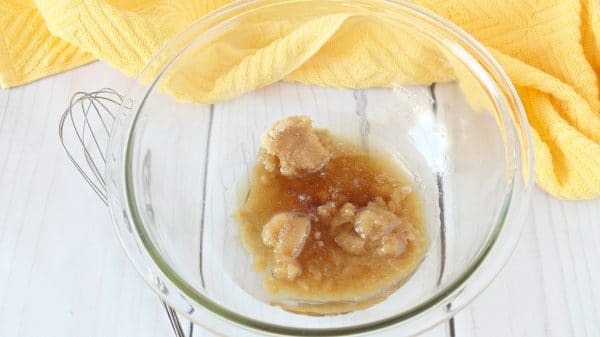 If you run out of applesauce, you can also try pureed prunes or apple butter. No joke! 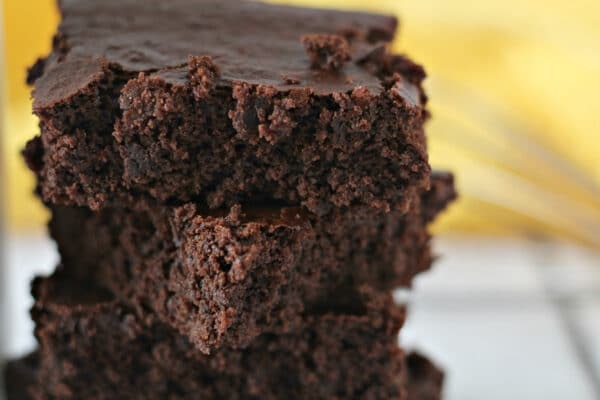 Don’t worry about their flavors competing, you’ll hardly notice they’re even in these vegan brownies, because the chocolate flavor of the raw cocoa powder will easily overpower the flavor of the applesauce (or the pureed prunes or apple butter, whichever you swap in). 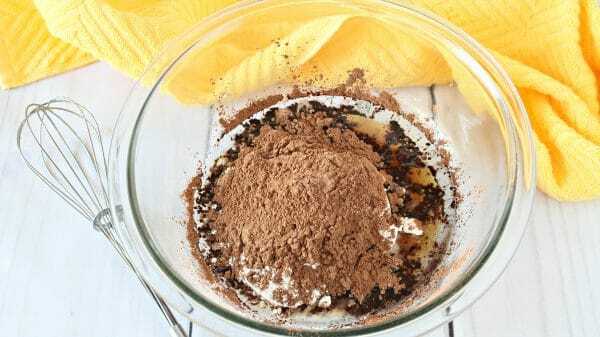 Is Pure Cocoa Powder Healthy? 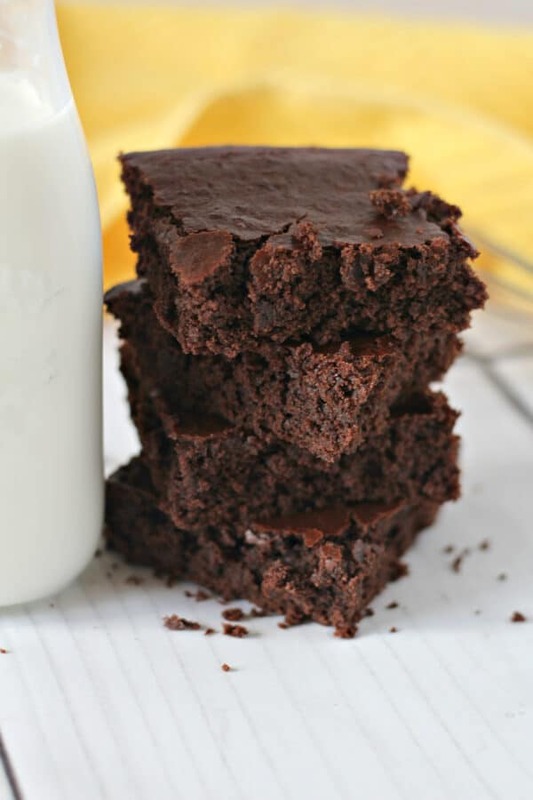 This brownie recipe uses raw cocoa powder, which is naturally vegan. And it’s also easy to work with – no mess with melting chocolate! But no worries, I promise you, it’s still fudgy and still dangerously chocolatey! How long do vegan brownies last? Freshly baked vegan brownies will last for about 3 to 4 days at normal room temperature. Make sure to store them in a covered airtight container to prevent drying out. Can you freeze vegan brownies? Yes! 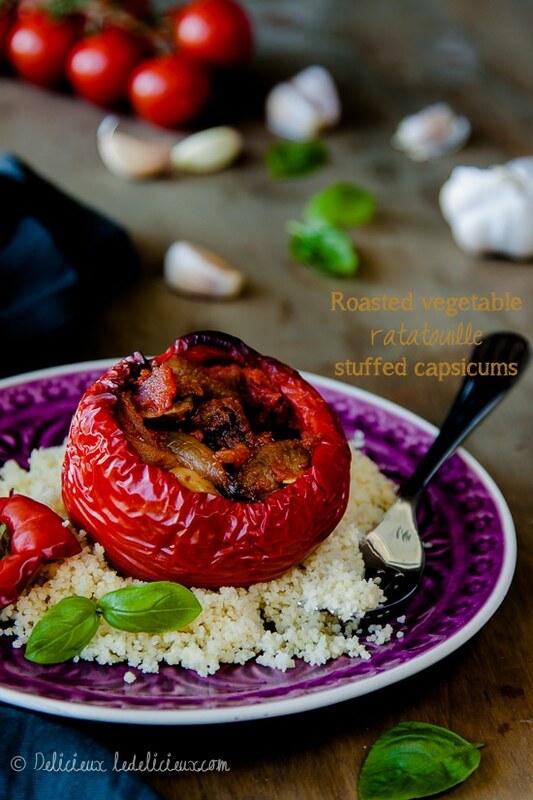 You can freeze them for 4 to 6 months if you wrap them tightly in aluminum foil or plastic freezer wrap. Get creative with the mix-ins! Use this as a base recipe for your vegan brownies, and add your own twist. 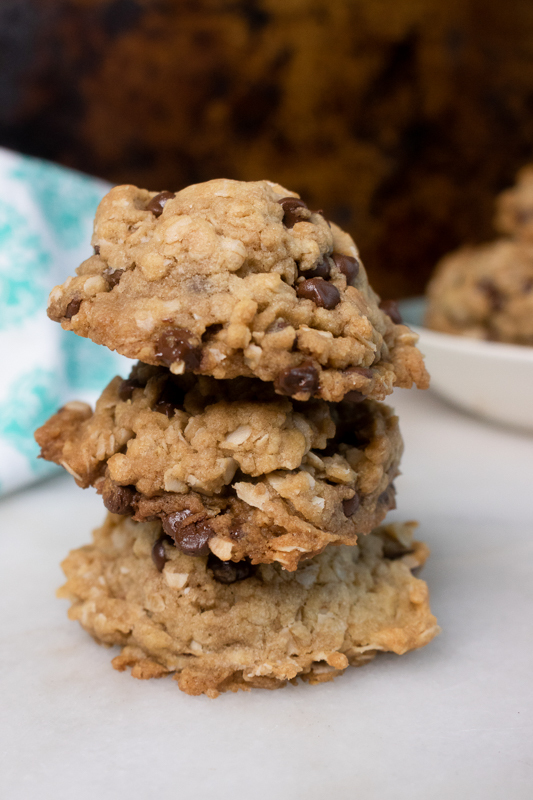 Toss in some dark chocolate chips, your favorite candies, or a swirl of caramel sauce for a whole new flavor! Pick the perfect pan. I like to make my brownies in one of these silicone brownie pans. Nothing sticks and it’s flexible, so it’s easy to get the cooked brownies out without breaking them. Use your favorite oil. 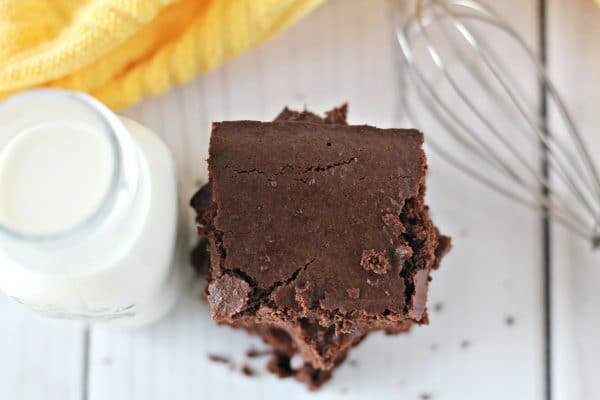 I used coconut oil for this brownie recipe because I love that little bit of coconut scented flavor. But you can use regular vegetable oil or even olive oil if that’s what you have on hand. 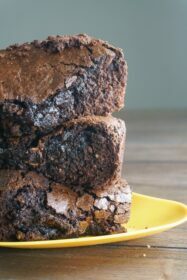 In fact, these olive oil brownies are one of my most popular desserts. Make them gluten free. 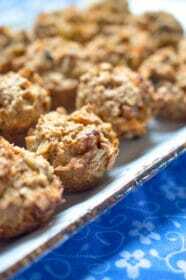 Just use a gluten-free baking flour in place of the all-purpose flour to make this recipe 100% gluten free. 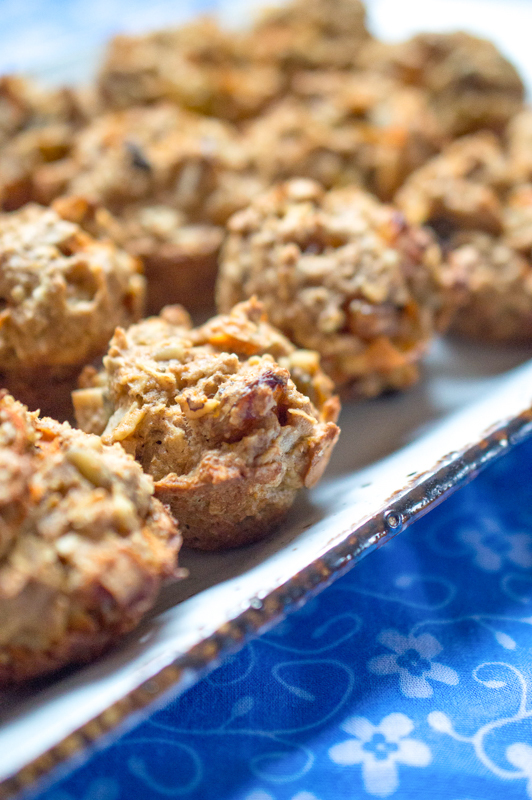 I like this one from Bob’s Red Mill – because it’s easy to swap out 1:1 for regular flour. Serve it with milk! Almond milk that is… or your favorite dairy-free milk. It’s the perfect match for this chocolatey treat. 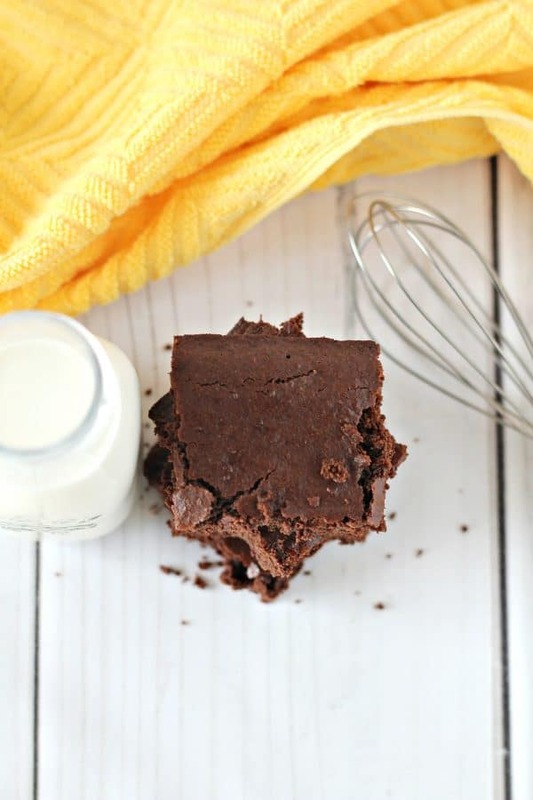 A batch of these freshly baked homemade vegan brownies will satisfy your inner chocoholic! 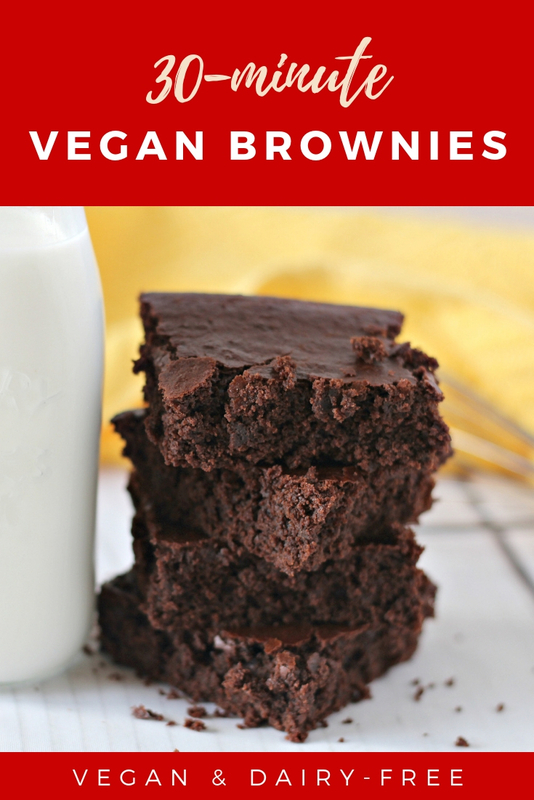 They're just like the brownies you remember from childhood - but veganized! 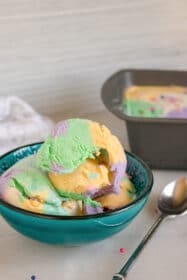 Plus they're simple to make from scratch in just 30 minutes. Start by creaming together your sugar, oil, and water. Add in your flour, salt, applesauce, vanilla, cocoa, and baking soda.